It was only around five years ago that Jasmeet Singh, then a bored summer school student living in Guelph (Ontario, Canada), posted his first YouTube video. Since then, his on-point commentary on race, his parodies of pop culture and his comedic deadpan have earned him a significant following: 425,000 subscribers on YouTube and another 780,000 on Vine, where his six-second videos have been looped almost half a billion times. Jasmeet Singh, better known on the internet as JusReign, uses nearly every social media platform in existence to rant, criticize, and crack jokes -- often at the expense of white people who can’t tell a turban from a niqab. We talked with him about racism, turbans and making a living on the internet. Q: How did Jasmeet Singh become Jus Reign? A [Jasmeet Singh]: I was in university, and I was doing summer school and I was really bored. I used to make a lot of short films and sketches in high school, so I decided to make a YouTube account. I was 19 when I made my first video, “25 Random Things in my Room.” I started doing more and more content, and it just started spreading. Q: What was the first one to go viral? Q: What does that name even mean? A: I got this name when I was like 14. I used to DJ, mixing hip hop with Punjabi music. My name was DJ Double Edge. But there was another DJ Double Edge in Toronto, a Jamaican DJ. He hit me up on MSN and was like, “Hey boy, you can’t have that name.” My cousin suggested Jus Reign, like I was going to reign over everybody. 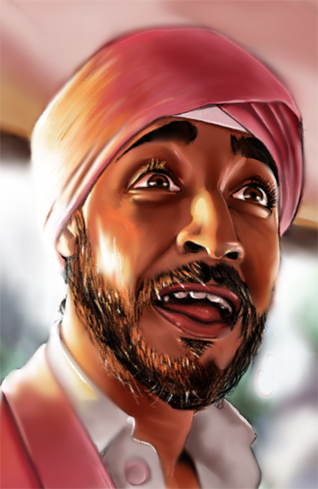 I never called myself Jus Reign -- it was the name of my channel. But then people started calling me that, and it just stuck. Q: Isn’t it weird to still have an alias that you used when you were 14? A: Yeah, it’s kind of a silly name. But now it’s just there. I don’t even think about it. Q: You grew up in Guelph. What was that like? A: That was an interesting experience, because I was the only brown kid. Q: And did your humour help you deal with standing out like that? A: Yeah. I think after 9/11, there was a sense of mistaken identity. My parents are from Punjab; we’re Sikh. We have nothing to do with the Middle East -- not to bash the Middle East. So everybody thought I was Osama’s nephew or something, and I just had to deal with that. My way of brushing it off and fitting in, of deflecting negativity that was thrown my way, was to be funny. I remember being cornered and joking my way out of fights. Even to this day, I’ve joked my way out of fights by making the other person look silly. Q: You do some pretty harsh impersonations of Indian parents. What do your Sikh parents make of that? A: When they first saw it, they hated it. I was pursuing being a doctor, because that was what my parents wanted me to be. I started doing these sketches, and they didn’t know about them. I just didn’t tell them. Within South Asian culture, it’s still frowned upon to be in the arts. It’s either a doctor, an engineer or a lawyer -- that’s all they want you to be. I actually wanted to go to film school, but my parents didn’t approve of that. The turnaround came when other parents came up to my parents with their approval, and then the money started coming in, so right now they’re supportive. Q: So is YouTube a full-time job for you now? A: Yeah. But a lot of YouTubers, like myself, have different streams of revenue. There’s merchandise, there are shows. I did a couple movies this year, including one in India. I’m one of the leads, and it was all because of YouTube. I love doing standup, and I eventually want to transition to that. Q: What’s your YouTube process like? A: I like to incorporate skits within my rants. Some people just do rants so they can upload quickly. Usually I’ll come up with an idea, and I’ll write a script, and I have a group of friends and I put them in my skits. It’s kind of turned into a mini TV show online. For a skit, I’ll write a loose script, and when we’re shooting it, we’ll improv a lot. It takes about a week. A few days of filming and a few days of editing. Q: And then there’s Vine, which seems like a pretty ideal vehicle for your type of humour. A: Vines I try to do every day. Vine is a totally different world. People think making a Vine is easy, but you have to capture someone’s attention in six seconds. Vine was something that got my content to another level. Q: The Bindi-Zit one is pretty good. A: I had to shoot a video that day, and the zit was huge, massive. But it’s like when I deal with racism: I like to take something bad and turn it into comedy. Never take yourself too seriously. So I had this huge zit on my forehead, and I could either sulk about it or just turn it into something totally hilarious. So I turned it into my dad being mad about this zit. Q: You spend a lot of time talking about racism. What did you make of the recent mayoral election? A: I remember that Olivia Chow cartoon. I’m not surprised because as much as I’d like to say that racism doesn’t exist, it does. I see it when I’m in public. There are certain places where I go and I’ll get stared at. It’s something I’m accustomed to. People will come up to me and say, “Oh man, I never knew an Arab guy could be so funny. You guys are all Al-Qaeda and stuff, but it’s so great.” It’s like going up to an Irish guy and saying, “Man, I love Italians.” I think it’s going to be there always, and I think that the best way to counter that is through entertainment. Q: In an ideal world how would people get along? A: I think we should embrace our differences. It’s all about your intentions. People who are racist want to bring others down -- that’s different than joking around with your friends. I have friends from all different backgrounds, and we joke about our cultures and our differences and how we act. And there are different levels of racism. I always bring this back to 9/11, because after that the only depiction of brown people was with Al-Qaeda and the Taliban, and the only depiction of a turban was like Osama and his crew sitting in a cave. Ninety-nine per cent of people who wear turbans are Sikhs, and we’re from Punjab. I don’t think any news organizations did a good job of differentiating who’s who. And I don’t think it’s getting any better with Charlie Hebdo in France. Don’t be scared of a turban. We’re normal people. Then there’s a contingent of people who think that if you ignore racism it’ll go away. Yeah, and there’s also oversensitivity about racism. I don’t want people to be scared to ask me questions. If you ask me if you can touch my turban, yeah, go ahead and touch my turban. It’s better than having restrictions and feeling uncomfortable. I want people to feel comfortable. Q: So you don’t actually mind when someone asks you if you take your turban off when you go to the bathroom? A: Well, that’s hilarious. If you’re going to ask me how I wash my hair with my turban on -- these are common sense questions. It’s 2015. Everything you need to know about life is on the Internet. Sometimes I think people choose to be ignorant or racist. If you see someone wearing a hat, or a dress, or a turban, it’s all the same. Q: In your “Bounce” video, there are some pretty complicated dance moves. How did the choreography work? A: It’s just weird, lightly Punjabi dancing. As soon as I heard the song in that’s used in the video, I saw myself dancing in my head. In the comments, people have written like university-level essays about what they think the video means. Q: I have to ask: what do you keep in your turban? A: Ten grenades, plastic explosives and a plane. The Malaysia Airlines plane that went missing is actually in here. 1: Harinder Singh (Punjab), January 30, 2015, 6:12 PM. Tussi great ho, Bha ji. 2: Baldev Singh (Bradford, United Kingdom), January 30, 2015, 9:29 PM. 3: Sunny Grewal (Abbotsford, British Columbia, Canada), January 30, 2015, 10:33 PM. This is the man who coined the term 'Drunkle'. A drunk uncle. Ha-Ha-Ha! The Phenomenon of Jasmeet Singh"